The Speedo Fin that we have all been waiting for! the switchblade fin. With new technologies that have never been seen! 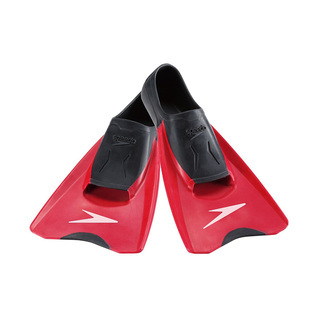 These include a 10% integrated blade angle that maximizes distance and promotes a proper kick cycle, a Delta Whip Drive (DWD) that optimizes the fin flexibility, Flex point markers that expand to support the foot's contour shape, an extended toe pocket that will comfortably fit a variety of foot sizes, and of course Sculpted Side rails that engage hip rotation and down kick drive, this shape targets optimum kicking surface area.